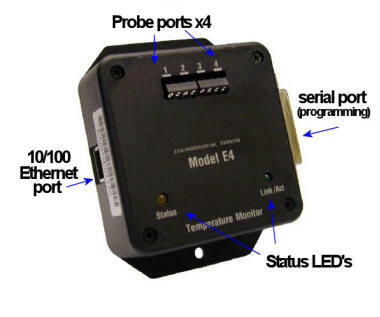 If the basic TempElertUSB unit is not full featured enough for you, consider this enterprise class hardware solution that can monitor 4 or 16 locations at once, features a built in webserver, advanced reporting, and multichannel display software that features the ability to interface directly with a telephone dialer as a backup alerting system. These simple and easy to use remote networked thermometers connect to ANY TCP/IP compatible Ethernet connection, be it direct, switched, on a hub or behind a firewall and it will report the temperature and status of switches via a web browser! Once these devices are programmed, they are truly set and forget. Probes are available in a variety of styles and lengths, with custom lengths available. TempElert USB and TempElert Multichannel is sold exclusively by ItWorks, reseller inquiries are welcome.